Many business professionals are now embracing the iPhone, first touted by Mac enthusiasts and techies. Both the Blackberry and Palm brand of phones were almost exclusively used by companies because of their security features, which the iPhone lacked, until the launch of the iPhone 3G. Better security features coupled with the development of numerous applications, has catapulted the iPhone to the front of the business-user ranks of PDAs. Developers are beginning to target specific users for their applications, and project managers are one such group. Collaboration, sharing, and communication are essential functions in project management and finding the right tools to support those functions can be tedious with the hundreds of applications available on iTunes. Here, we’ve put together a list of ten iPhone applications you may want to check out as most of these apps can now be used with the iPad 2 as well. 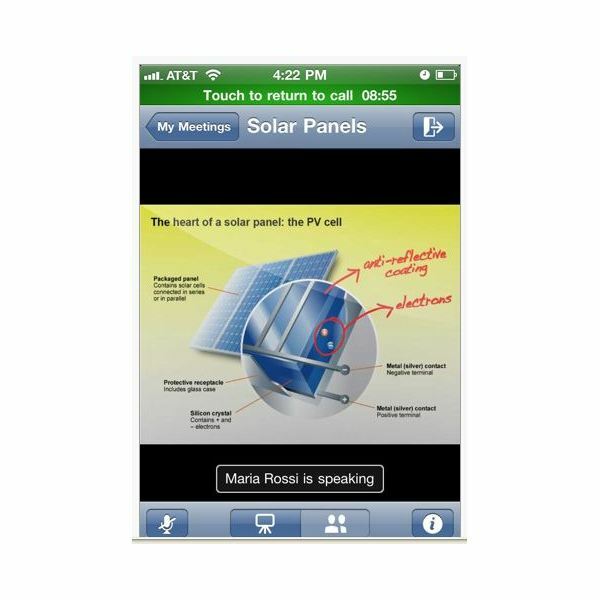 Cisco’s Webex Meeting Center is a free iPhone application now in version 4.0 with a file size of 17.4 MB. This app makes it easy to implement conference calls right from your iPhone in 10 different languages. Your iPhone operating system must be 3.0 or higher and allow you to set up a video or audio conference, designate a host and each attendee by a single tap on the individual’s name. Webex offers document and note sharing, indicates to all attendees who is speaking and can interact with any computer, not just Macs. You can schedule meetings and even cancel a previously scheduled meeting and even change the host of the meeting all in touch or pinch on your iPhone. Cisco has updated the app to work on the iPad as well. If you’re on the go and need to stay in touch with your team, this app is a must-have project management tool. For just $4.99, Left Coast Logic offers up SmartTime 4, now in version 6.0.1 with a file size of 4.9 MB. 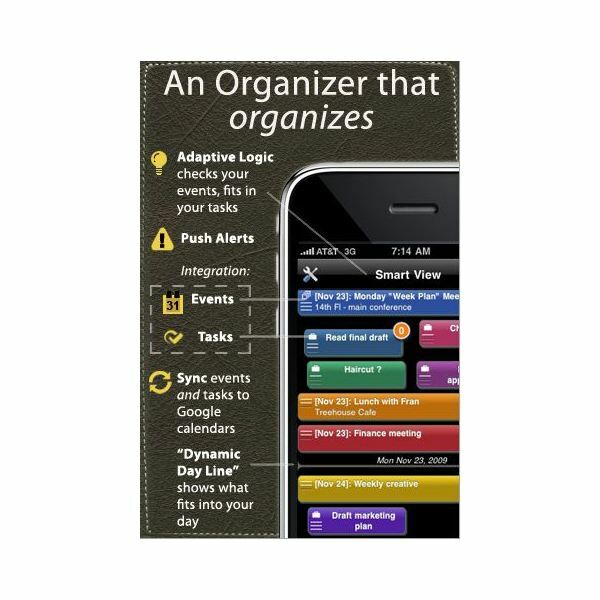 The SmartTime application can help you stay organized. SmartTime helps you visually prioritize your tasks, events, and appointments into a single view. A nice feature of this app is its ability to show you instantly where you have time slots open for any given day by using its trademarked Floating Dynamic Day mode. It integrates with Google calender and maps if you need those, offers pop-up alert reminders and you can shoot off emails to your project team while you’re on the go–a great tool if you manage many projects. For this app for managing projects, your iPhone operating system must be at least 4.0. From Box.net, Inc comes a great, free organizer tool, Box.Net, now in version 2.8.3 with a file size of 26.1 MB. Box.Net is a Web-based service that allows you to upload and store your files from you Mac or PC to your Box.Net account. The iPhone application connects to your online account, from which you can view Word documents, PDFs, spreadsheets, presentations, images and more. A great feature of Box.Net is its ability to share and collaborate with others on a single document, multiple documents, or files – similar to Google Docs. You can even save files and docs to your iPhone or iPad and view and edit them when offline. It also features great tools right from within the app such as accessing FedEx, Zoho spreadsheets, eFax and more. From Magnetism Studios comes FileMagnet, now in version 2.02 with a file size of 2.1 MB–this app can be used on both the iPhone and the iPad for a cost of only $4.99. If you prefer to keep your files out of the cloud, try FileMagnet. 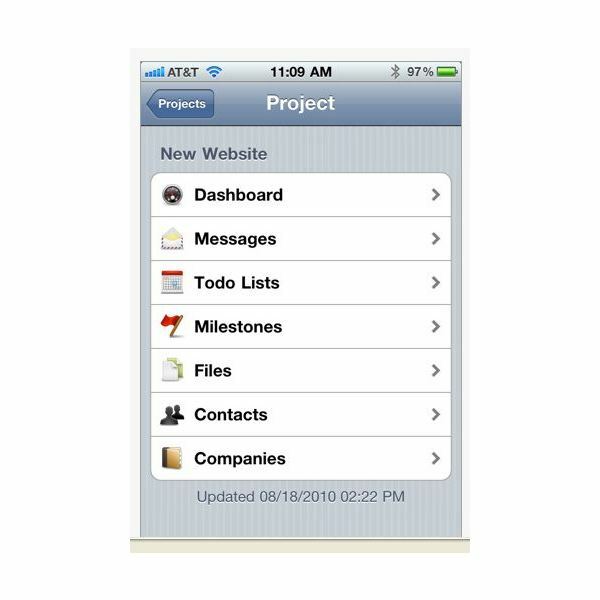 This project management application for the iPhone allows you to wirelessly transfer files from your PC or Mac. With FileMagnet, project managers can take their important presentations or status reports on the road – or golf course. 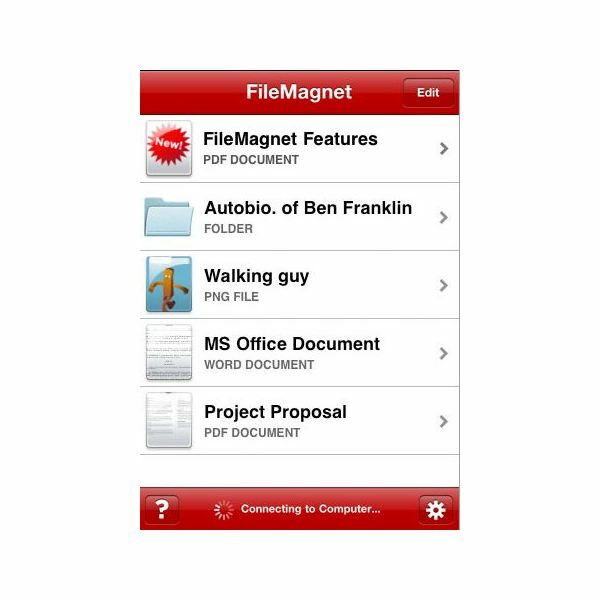 The application is simple to use, just open FileMagnet on your iPhone and your computer and the two will connect and copy files automatically. Even RTF, text and HTML files can be downloaded and this app has a nice password protection feature if security is important in managing your projects. From Guided Ways Technology comes this great contact management app appropriately named Groups: SMS, Mail & Manage Contacts. This productivity app is now in version 2.4.1 with a file size of 7.8 MB. Managing projects means managing multiple teams all of whom a project manager will have to contact at one time or another. The Contact Groups application helps make managing multiple contacts easier. The application is priced at $4.99, but comes with robust features such as its ability to turn your iPhone or iPad into a Rolodex. Mass e-mail or text everyone on your project team, create groups for dedicated project teams and merge everyone on your group contact list in a single touch. It also offers map locations for every one of your contacts and supports both portrait and landscape modes. A great app for the project manager who wants to get the message out fast–to everyone on the team in an organized fashion. If you use Basecamp for project management, then you will enjoy the Base Camp iPhone application – OutPost 2. OutPost 2 now in version 2.2.1 with a file size of 5.9 MB is a pricer iPhone application for project management at $19.99. The app allows Basecamp users to access their accounts from their iPhones or iPads. OutPost retains many of the same features as the Web-based application such as milestones and to-do lists. OutPost supports multiple Basecamp accounts and includes an address book for easy access to emailing groups or project teams. It also offers the capability of downloading certain project elements such as to do lists, where again, you can work with the documents when in an offline mode. 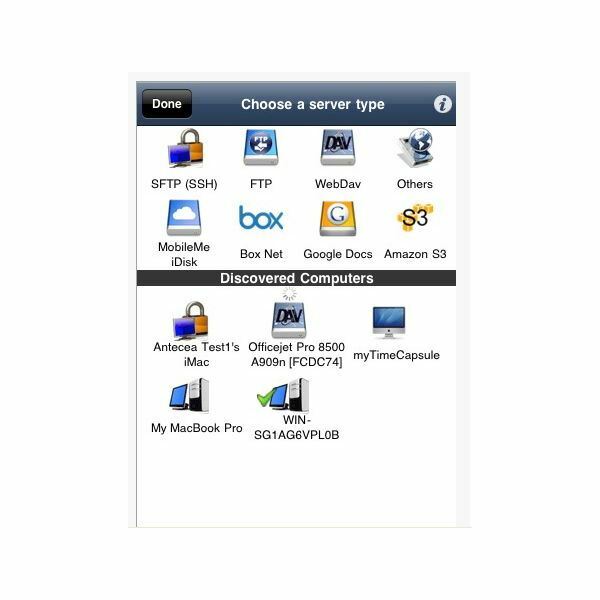 Antecea Inc’s ezShare Pro allows iPhone users to VPN into their company’s network and access all of their business files. ezShare can also be used to access files on a FTP server, home computer, Mac Time Capsule, and Google Docs – project managers will never have to worry about forgetting files with ezShare. Another useful function of the application is the ability to print any of the accessed files, regardless of location. Now in version 3.0.1 with a file size of 8.3 MB, ezShare Pro is also a pricer app at $15.99 but it’s worth it for all the features. You can even view or control your computer’s desktop remotely–think of GoToMyPC here. It comes with a custom .pdf viewer and transferred data is encrypted for extra security. A great app for the PM who needs to be two places at once! 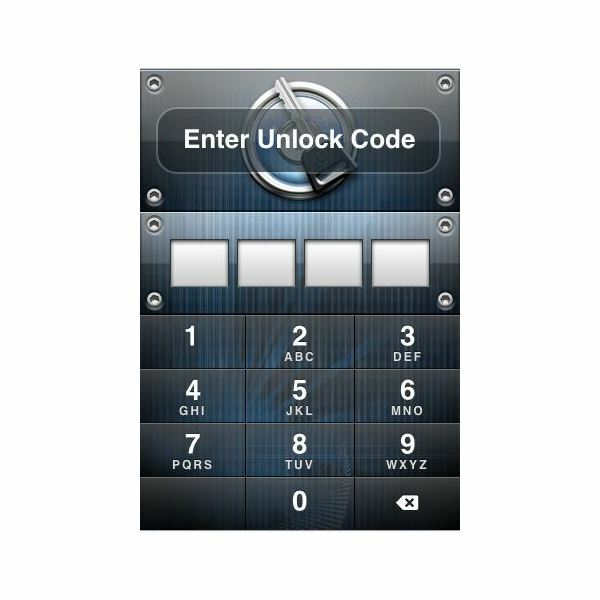 From Agile Web Solutions comes 1Password–such a popular app the iTunes store says it has over one million users. Now in version 4.1.2 with a file size of 22.0 MB, 1Password is a safe place to keep codes, emails, and passwords secure. iPhone applications normally come with Web-based accounts, but remembering all of those passwords for those accounts can be a headache. 1Password can help ease the nightmare of password management. The popularity of this app has turned the price from free to $17.99–most likely because you can use it on the iPad 2. The 1Password app uses a four-digit unlock code to access all of your websites–you can log in with a single keystroke. The two-layer defense system of 1Password gives piece of mind to project managers, who are accessing websites for various projects. 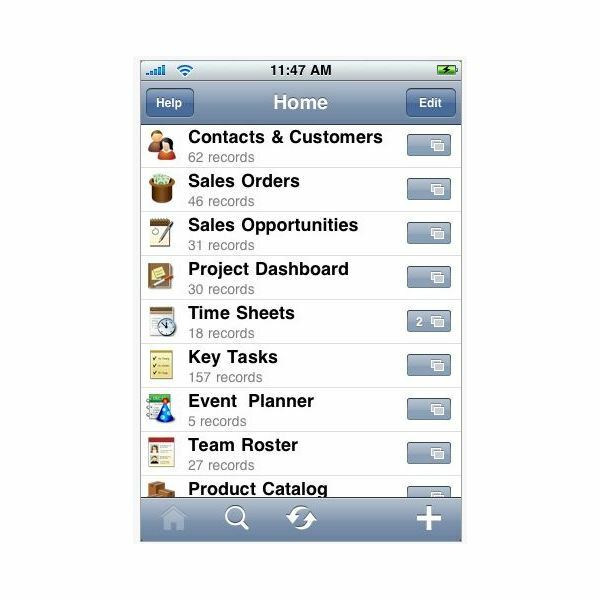 From Filemaker Inc. comes an app to help you and your projects stay organized. Just released in March of 2011 and in version 1.2.2 with a file size of 11.5 MB you can organize, track and plan all of your projects on the go with Bento. It comes with 25 built-in templates (not all for project management) but most will make your life easier. From XPT Software & Consulting comes SimpleMind eXpress now in version 1.6.6 with a file size of 4.6 MB–and it’s free! Need an application that offers brainstorming and idea formulation? There’s an app for that – SimpleMind eXpress. The free mind-mapping application can be used by project managers to brainstorm ideas, and solutions to troublesome issues. Simply drag and arrange ideas and topics on a single mind map or between mind maps. 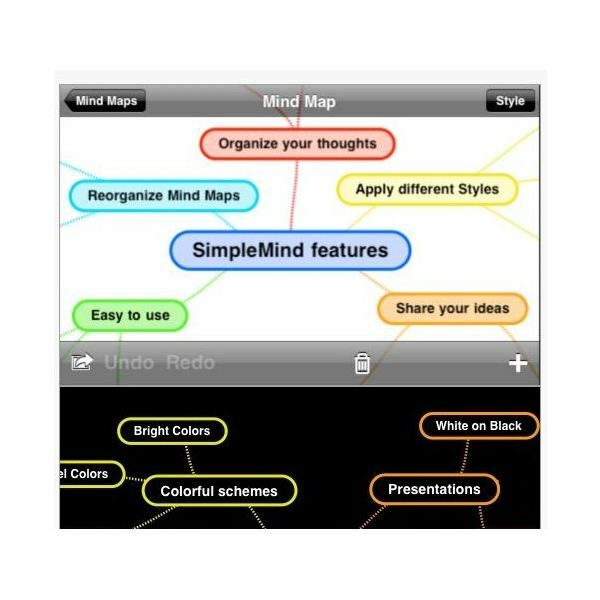 SimpleMind express mind maps can be shared with others, although it does not support multiple user collaboration. It requires an operating system of 3.0 or higher, but this iPhone application is a must if your project team is in to mind mapping!